The comings and goings of birds on a Norfolk grazing marsh with occasional forays further afield. After the excitement and travelling of the past 2 weeks I was hoping for a quieter weekend. Friends were coming over on Saturday and I planned for a gentle days birding on the Norfolk coast on Sunday. Things changed with the news that my mother was in hospital having fractured her pelvis in a fall. A trip to Derby was now required. It was an early start on Sunday; my younger daughter needed to be dropped off at a swimming gala at Bury St Edmunds at 8am before I headed north. Hence I was on the A14 north of Cambridge when the pager mega-alerted. I couldn't believe it, a Citril Finch in Norfolk! I had only commented the previous weekend it was about time for another big bird in Norfolk. Now it had happened and I was heading away from my home county. I briefly considered the option of going to Derby via Burnham Overy but decided it wasn't really a practical and consoled myself instead by calling in briefly at Ferry Meadows, Peterborough just off the A1 for a Red-rumped Swallow. I arrived in Derby as the pager started reporting the Citril Finch as showing well and texts came from friends first asking what I was doing about the bird and then commiserating after I replied. I sorted out my dads phone answer machine then, after my brother arrived, headed to the hospital. My mum was very bright and the news was better than expected, no surgery was required and physiotherapy was to be started that afternoon. After the hospital visit, we took my dad to the supermarket and introduced him to ready-meals. He can't cook and he had been living on fish and chips from the local chippy. After teaching him how to use the microwave, having a sandwich and a cup of tea it was time to leave. It was 15.45. I typed Holkham in to my sat-nav and it gave me an arrival time of 18.47. Should I give it a go? I had to work the next day, so time would be tight then too and Holkham was only a small detour off my normal route. It was worth a try and I set off hoping the traffic gods would smile on me. A hold up could spell disaster. As it turned out, the gods were munificent. Every single traffic light through Nottingham was green, the traffic on the A52 was travelling at speeds near to the speed limit and even the normally cursed A17 was moving at a good pace. The minutes were steadily dropping off my e.t.a but once I hit the empty B roads of Norfolk they poured away and I pulled in to Lady Ann's drive at 18.17. Even the ticket machine joined in my good fortune by giving me my money back plus an extra 50p along with my ticket! There was just the 1.5 mile walk to complete which seemed endless. Happy birders on their way back from the bird reassured me it was showing well and "looked settled", (frequently words of doom) and at long last I turned a corner, walked over a small brow and came across a group of maybe 10 birders and Richard Thewlis painting. I had expected a bigger crowd but this was indeed the bird. I asked the nearest birder (who turned out to be Chris Craig) if I could look through his scope (thanks Chris) and after an anxious few seconds when the bird was hidden behind some vegetation, the Citril Finch finally emerged in to view and on to my list. Huge relief and joy! I enjoyed excellent views for the next 15 minutes as it fed on seeds on a tiny patch of sand on a bank right on the edge of the pines. Then suddenly it flew up in to the pines on my right and was not seen again that evening. The news of a Great Blue Heron, a second for Britain, on the Isles of Scilly on April 15th sparked only mild interest in me at first. It was a long way away, the bird was being awkward and as I had to work on Saturday morning I couldn't go anyway. The bird stayed, however, became more settled on the pool on Bryher and I was free the following Saturday; my interest levels began to rise... One small problem though, as most of the people I knew who wanted to go down to Scilly had already gone or were going on Friday I found myself without a car share. The prospect of a solo drive to Penzance was one I didn't want to do so it looked like I was stuck again. Out of the blue I was offered a place in a car IF someone dropped out. There was an anxious wait until Friday but the crew remained intact and I had no place. Then they offered to squeeze me in (I am only little) but unable to get an appropriate flight off Scilly I had to decline. I went to bed somewhat glumly, at least I would get a lie in for the first time in several weeks. The following morning I woke at 8.05 and glanced idly at my mobile phone. Surprisingly for the time of day there were 2 text messages. The words Hudsonian Godwit Somerset had me instantly wide awake. Turning to my slumbering husband I announced I was going to Somerset and leapt out of bed. My husband had seen the 1983 bird so I hastily arranged to meet up with my friend James in Letchworth for the long drive west. Two small obstacles delayed my leaving, my elder daughter was off on a Duke of Edinburgh practice expedition and had to be got ready and there were bottle-reared lambs to feed. Daughter was seen off with me clutching bottles of milk in each hand and I finally hit the road at 8.55. My sat-nav reckoned I wouldn't be in Letchworth until 11.15 but lets just say I beat that time with plenty to spare. It was only when we were ploughing around the M25 did I remember that I had forgotten to make my daughter a packed lunch (oops), but as James said, the Duke of Edinburgh award is supposed to be character building! We had an anxious 3 1/4 hour drive down to Shapwick but regular updates on the pager reassured us the bird was still there. The large car park was just about full but we found a place and made the walk to the godwit at a brisk pace passing happy, relaxed birders returning along the embankment. Too our huge relief the godwit was on show when we joined the crowd and it put on a superb show posing at every angle, lifting its wings to show off its smoky black underwings and flying around occasionally displaying its wing bars. After watching it for an hour and a half it was out turn to amble happily back to the car. We left the car park at 4.15 with birders still arriving unaware that the godwit had flown off. On the drive home we made plans to go to Scilly the following weekend if the Great Blue Heron was still around and as it was the World Pilot Gig championships that weekend we both booked places on the Scillonian in hope.The heron obliging moved to St Marys at the start of the week but on Friday the news wasn't good, just a single no sign message at lunchtime. Reasoning that we would be gutted if the bird was still there on Saturday we gambled and set off on the long drive westward buoyed by a message reporting the bird still present. It was a dismal damp day in Penzance which meant staying below decks on the Scillonian but dosed up with Stugeron I survived the voyage. Finally on St Marys, we joined a small group of birders route marching from the quay to Lower Moors, winding our way through the packed gig rowers above Town Beach. 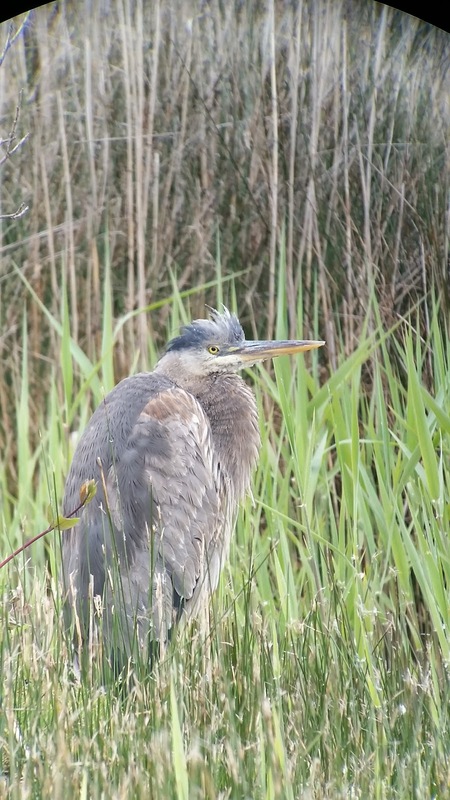 We piled in to the ISBG hide and there was the Great Blue Heron straight out in full view, looking a little damp but actively preening. Phew! 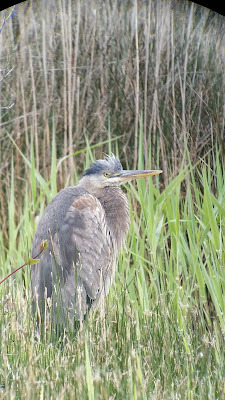 After an amble across the island we returned to Lower Moors for another look and found the heron actively hunting close to the hide, often peering intently in to the rushes before pouncing on a hapless eel. It was soon time to return to the Scillonian to start the long weary journey home but it had been a trip well worth doing. The arrival of a Laughing Gull in February on The Wirral sparked a little interest in me. I have only seen 2 in the UK, the last in 1992 but New Brighton is a long way from Norfolk so I let it lie. However back in January I had been booked by my boss on a one day course in Chester. As the course date approached I noticed that New Brighton and Chester aren't that far apart and joined very conveniently by a handy motorway. With my course not starting until 9.30 I would have a an hour or two to look for the gull beforehand although with some birders not seeing the bird until mid-morning I was hoping I'd be lucky. I arrived by the side of the Marine Lake at 7.20 on Thursday morning with a brisk chilly wind blowing . Things didn't look promising, there wasn't a single gull on the lake, and just one Cormorant, a Canada Goose and a Redshank graced its surface. However within 2 minutes gulls appeared wheeling overhead as if drawn by the feeding potential from a human figure. Amongst the Black-headed and Herring Gulls was a medium-sized gull with a droopy bill, the Laughing Gull itself, which did a couple of flypasts before dropping down on to the pontoon immediately below me, the only gull to do so. It stayed there for half an hour, just once taking off for a quick circle around above my head before dropping back on to exactly the same spot giving scope filling views. The first week of March was a little quiet for me in Patchwork Challenge terms with no new species added. Chris meanwhile had seen what would have been new birds for the year for me starting with Coot, then Siskin and today, when I got back from work, he was viewing his photos of 2 Grey Partridge that had been in the garden under the bird feeders just 45 minutes before. I wandered upstairs to get changed but first scanned the marshes. All seemed quiet but as the scope went across the neighbours rush-covered marsh a distinctive black, white and red head with a dagger beak popped up, a Crane!!! Chris and daughters were quickly summoned to share this awesome bird especially as the youngest, with no interest in birds whatsoever, had enjoyed seeing Cranes at Horsey in November despite (or maybe because of) describing them as looking like emus. When she looked through the scope she couldn't see the crane at first but then announced there were two. Sure enough a second crane had stalked out of the rushes. The birds were wary but actively feeding, uprooting various pieces of vegetation and tossing it to the side. They eventually settled in one spot and were still there as dusk fell. The last time I saw cranes here was in 1999 when 3 flew over without stopping so despite living on the edge of the Broads they are remarkably scarce here. Much less scarce are Reed Buntings which have been increasing out on the marshes. The garden adjoins the marshes but until about 3 years ago they were very rare in the garden itself. Now, however, they seem to have discovered the benefits of bird feeders. From 1s and 2s in 2012, to 4 or 5 in 2013/14, this year they've become the commonest bird at the feeders with numbers in the high teens. There seems to be a constant procession of birds coming in off the marsh and where there were once just males (why? ), the numbers of females are increasing too. The Tree Sparrows are still here although they are visiting the feeders much less making them harder to see except in the early morning and dusk when 6 of them roost in a favoured hedge. Their chattering calls announce their presence. We were going to get that particular hedge laid this year but our plans have been postponed until next year so as not to disturb them. Away from home, although not far, I made a second attempt for the Richards Pipit at Breydon Water on a beautiful spring-like Saturday afternoon. I walked as far as the obvious large single bush near the small wind-pump scanning the fields as I went with no luck, just Stonechats, Meadow Pipits and Skylarks. It seemed an impossible task with a vast amount of suitable habitat. Working my way slowly back I spotted a movement not far in to the field and there it was, feeding in the grass, going in and out of view but still showing well. Despite years of birding in Norfolk this was a Norfolk tick (although Suffolk birders will disagree on this point). My January patchwork challenge score was poor although this was not unexpected. After all, spending 10 days out of the country is good for a world list but adds nothing to a patch list, and the final killer was going down with energy-sapping flu almost immediately after arriving home. Once back to a reasonable level of fitness it was time to hit the patch hard. Number 1 target was the Rough-legged Buzzard on Haddiscoe Island which was being seen regularly from The Mound in Waveney Forest. My problem was that for it to count I had to see it from the New Cut, my patch boundary. Four times I trudged out along the New Cut in often dismal weather and four times I failed. At least for one of those efforts, it turned out the bird was on the other side of the high reed-fringed bank of the River Waveney and hence out of view from the Cut. Last Wednesday afternoon saw my fifth attempt. The portents were good; I had visited Breydon Water at lunchtime and almost the first bird I saw as I walked up on to the South Wall was a Rough-leg being mobbed by 2 crows on the opposite bank. I settled myself 2/3 of the way along the New Cut and started scanning. The Island was alive with Short-eared Owls, I counted a least 8 in just one sweep across the marshes, some close, some distant, but their (to me) butterfly-like flight makes them distinctive. Marsh Harriers were regularly on patrol, the occasional Common Buzzard put in an appearance and a single ringtail Hen Harrier drifted from Reedham across to Fritton. A single smart peregrine was perched on the marsh and Barn owls began to emerge as the afternoon drew on. There was no sign of the Rough-leg. Suddenly in the far distance a large longish-winged raptor flying quickly and low across the marshes caught my eye. I could make out nothing on it until a Short-eared harried it and it flipped up to reveal a white tail base with a dark terminal band. Here was the Rough-leg at long last. I followed it for a minute or two hoping it would come closer but eventually it merged in to the haze and landed on a very distant gate becoming an indistinct blob. Other new birds were more of a surprise, not least the patch life tick I had. Coming home from work one afternoon I found the Haddiscoe Dam closed by a lorry in a dyke just a mile from home. Faced with the alternative of a 25 mile detour to get home, I parked my car up at the New Cut bridge and walked the mile and a half across the marshes to home. (Fortunately my car is fully equipped with walking boots, waterproof jacket, over-trousers, gloves, hat and spare bins for emergency twitches from work). Returning in the dark to pick up my car in the late evening Chris and I both spotted an owl sat on branch overhanging the road. There's occasionally a Tawny or Barn Owl on this branch but as we drove under it we both simultaneously noticed that this one had long ears! The car was quickly slammed in to reverse but the Long-eared owl, a patch tick, flew off across the fields never to be seen again. Two weeks ago the dog and I did a big circular walk across the marshes hoping there might be a Water Pipit around one of the many pools on both the arable and grazing marsh. The marshes were surprisingly quiet at first, the large flocks of lapwings and Golden Plover seeming to have moved on, but on the return leg Chris phoned me from the house to tell me about 6 White-fronted Geese he could see from his elevated view point, which I eventually tracked down behind a low ridge. Nearing the marsh edge 5 Barn Owls appeared and I enjoyed the sight of 3 Hares having a bit of March madness in February. I was just watching the dog, a little Jack Russell, tanking off in another fruitless pursuit of a Chinese Water Deer when a small falcon rocketed past across the reeds. It turned and came back across the path in front of me, a superb female Merlin, actually quite a rarity out here. The following weekend I was just about to head indoors after feeding the sheep when I head the distinctive wild sound of Bewicks Swans. I raced indoors to grab bins and head upstairs for an elevated view but I think they headed east low behind our wood and sadly I couldn't see them. However that afternoon on one of my rough-legless walks along the New Cut, I noticed a smaller swan amongst the 100 strong Mute Swan flock that winters on Thurlton marshes and had good views of a single Bewicks, another Patchwork 2 point bird. 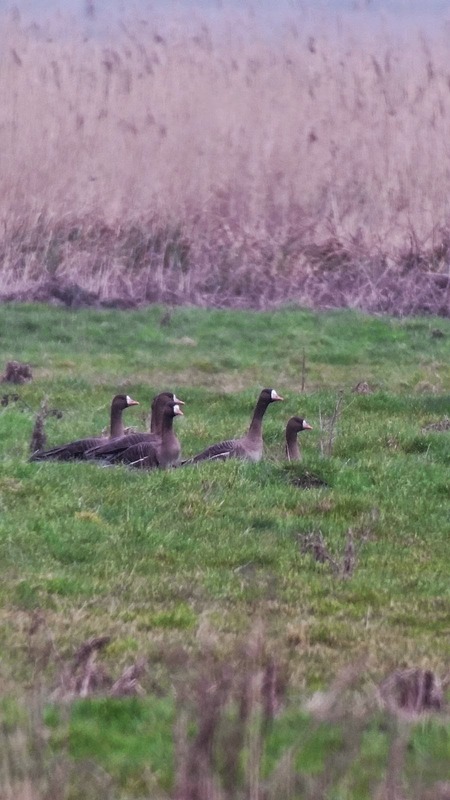 With the first returning Lesser Black-back of the year added today, February ended with 14 species and 19 points added. Patchwork is back on track. The next three days were spent birding the mid-altitude forest between Serra dos Toucanos Lodge and the town of Nova Friburgo. Nova Friburgo was the scene of a devastating flood and catastrophic mud slide just 4 years ago which killed several hundred people. It puts the UKs recent flooding "disasters" in to perspective. The only sign of the catastrophe today in Nova Friburgo is a bare, neatly terraced grassed hill side where there were once houses. On a lighter note, Nova Friburgo is the lingerie capital of Brazil; the road approaching it is lined by shop after shop selling nothing but underwear! Day 4 was spent along the Macae de Cima road walking a bit, driving a bit, walking a bit more and so on. It was a little slow to start. 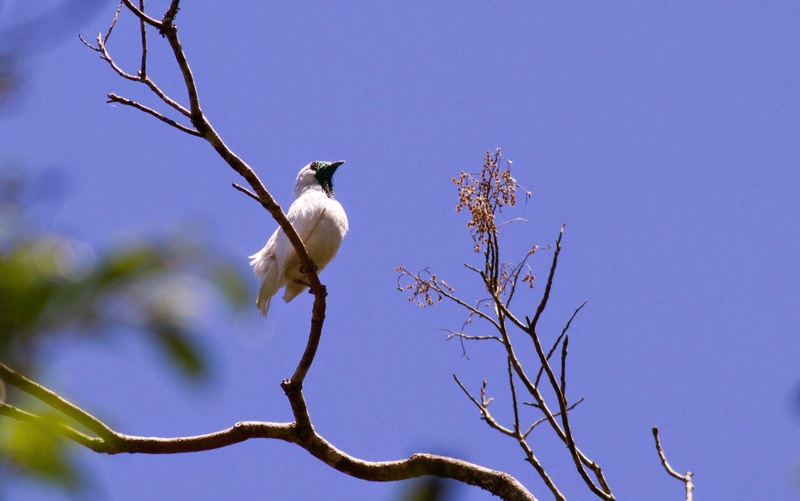 One of the target birds, the Bare-throated Bellbird, wasn't in its usual tree but there were others calling and we eventually found another perched distantly. Another target, a Serra Tyrant Manakin that had been singing from the same corner for 7 years obstinately refused to show. 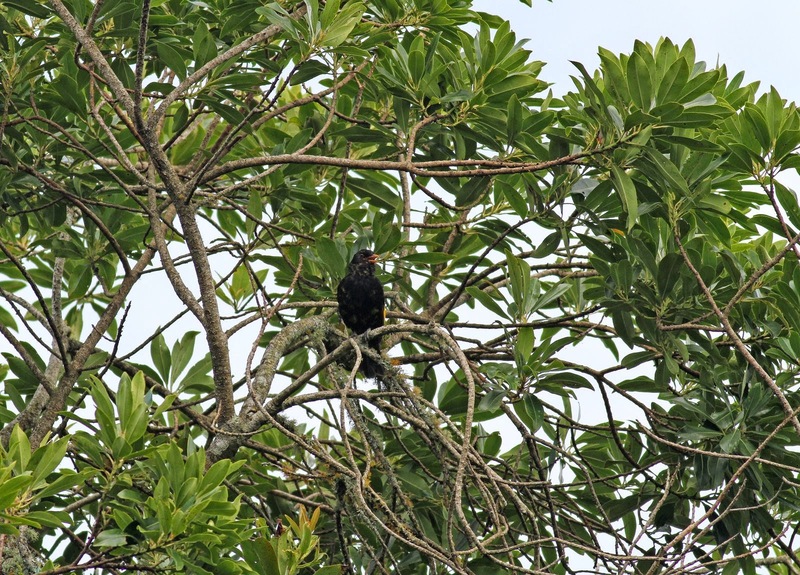 We were distracted by a Dusky-legged Guan looking rather ungainly as it ate fruit high in the top of a cercropia tree. As we walked back past the Manakin it started to sing again from within the forest. Taking a narrow path through the trees and up a slope the Manakin was finally located. It was hardly the most spectacular of birds, being a nondescript dull green but it was another very local species. We stopped for lunch but we had hardly started eating when a Surucua Trogon started calling and flew straight in above our heads. Trogons usually fly in, sit still doing very little and then fly off again. This one was very active and began feeding in the trees above us. 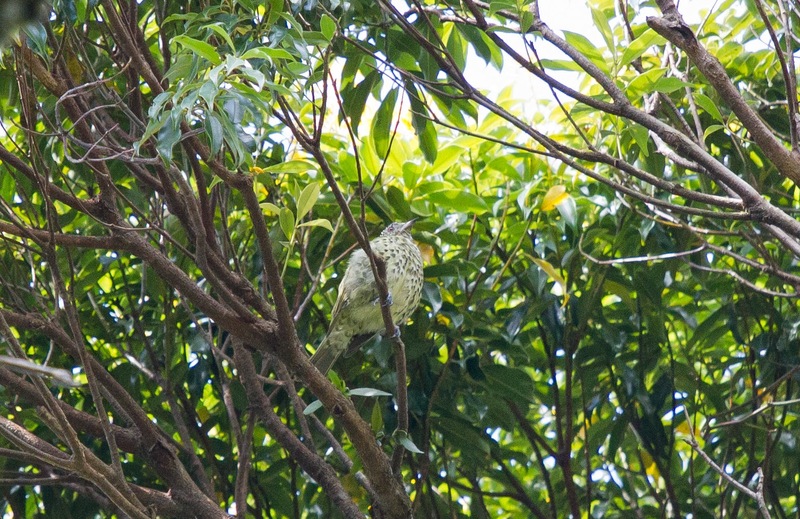 Walking on, we came across a very showy Bellbird calling insistently from the top of a tree above the path. Shortly after we were lucky to come across the very different female, a usually secretive bird. She had been drawn in by the male who took a keen interest in her. Next day we birded the Portao Azul trail all on foot. We had hardly left the minibus when new birds started showing all around. 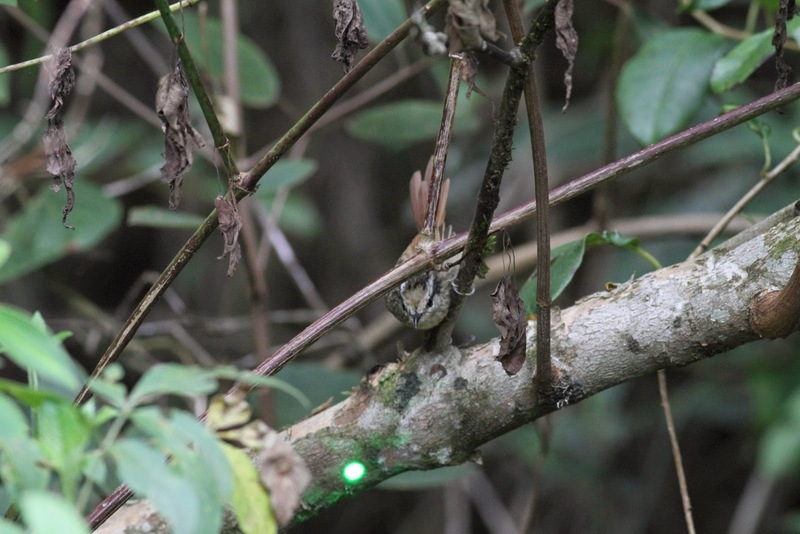 First, a Dusky-tailed Antbird, followed by Scale-throated Hermit, Scaled Woodcreeper and then a Bertoni's Antbird which appeared without the need for any use of the tape. 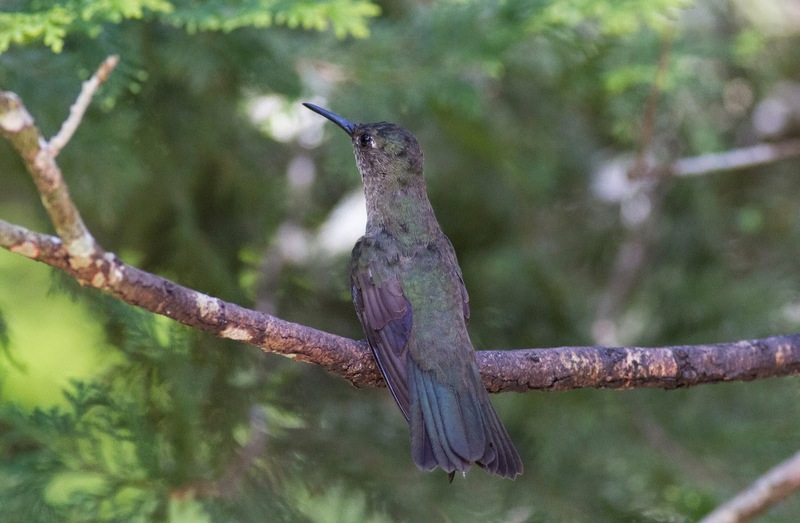 Suddenly I noticed a large woodcreeper probing a trunk with the most enormous down-curved bill, the appropriately named Black-billed Scythebill, a great bird to see. 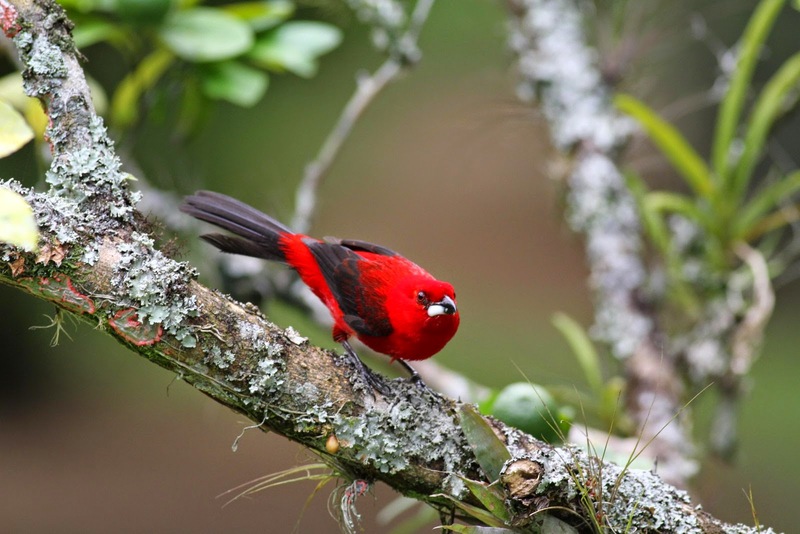 Walking on the trees seemed full of birds including Long-tailed and Shear-tailed Tyrants, Swallow Tanagers and the very attractive but difficult to photograph Gilt-edged and Red-headed Tanagers. We also had another Dusky-legged Guan wandering along the track in front of us like an elongated turkey. 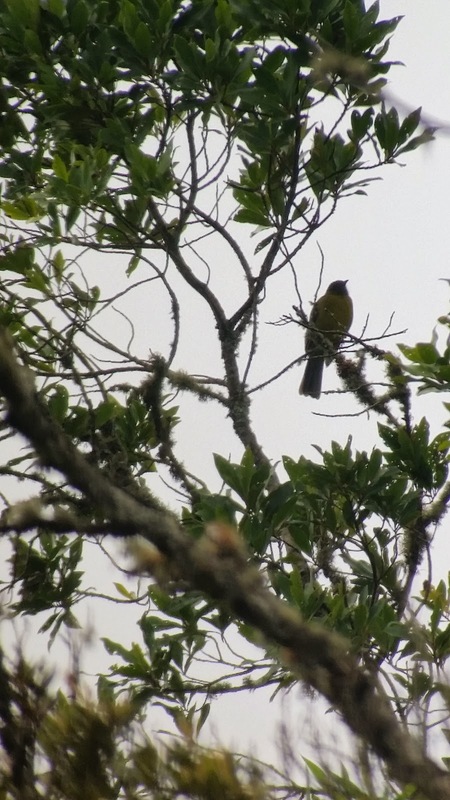 The icing on the cake was an Ochre-tailed Antbird, a species we had tried for repeatedly the previous day without success. Day 6 started very well when I spotted the superb looking Blond-crested Woodpecker outside the dining room as we ate breakfast. Todays trip was a visit to the Theodoro Trail just a short drive from the lodge. This had started as a railway line, was converted in to a road and then abandoned when the new road was built. It had been almost completely swallowed by the forest and in places was slipping down the hillside but it was a great birding site. 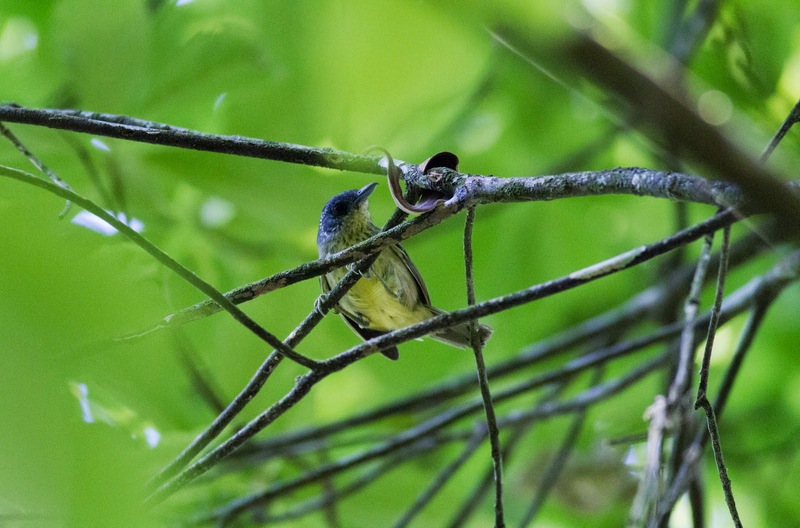 A cute little White-throated Spadebill posed beautifully for me to take its photo and we quickly ran in to a bird flock, unusual during the breeding season, but always exciting trying to sort through all the different species including several different foliage gleaners and tanagers. 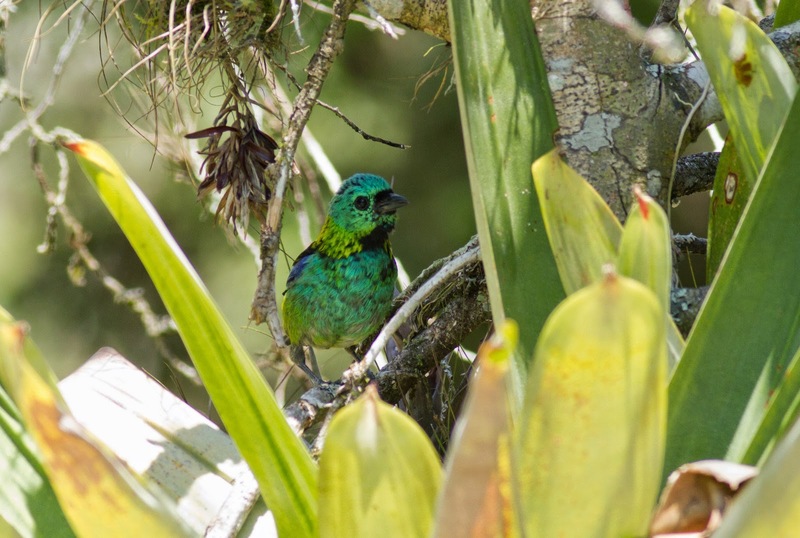 The endemic Azure-shouldered Tanager was one of the highlights. Skulking on the ground was a Rufous-breasted Leaftosser and further along a few of us managed a brief view of a Sharp-tailed Streamcreeper, both rather dull brown birds but with fantastic names. A Ferruginous Antbird put in an appearance (along with another Bertoni's) completing the set of 6 endemic antbirds we could hope to see. 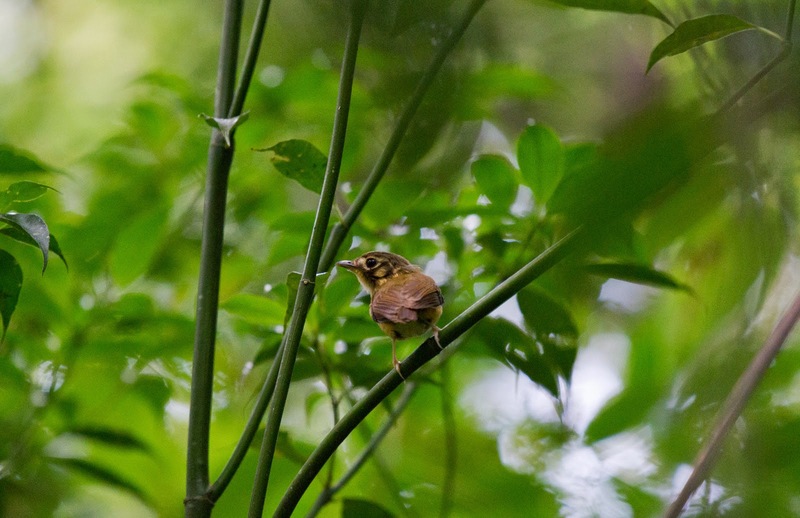 Meanwhile a Cryptic Anththrush serenaded us with its amazing song, an ascending series of notes become louder and more frantic until it seemed the bird must explode. 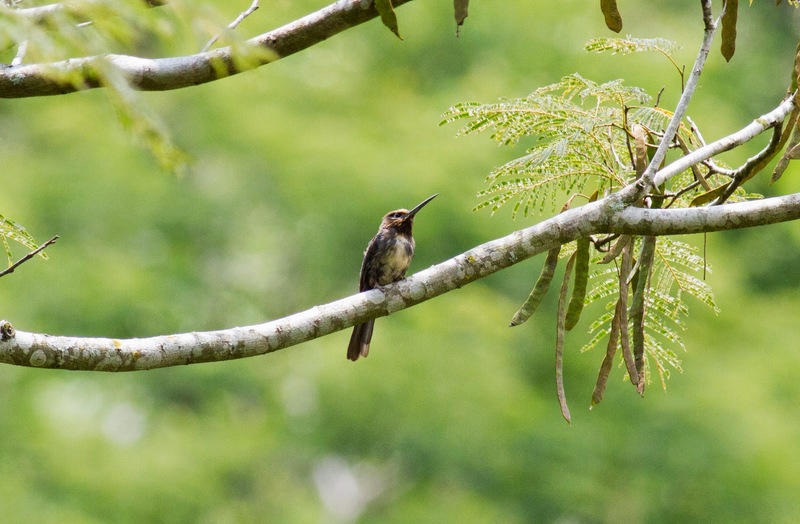 There was little hope of seeing this secretive bird so we concentrated instead on searching for the Sharpbill whose song was a single descending note like a falling artillery shell but without the explosion at the end. It was a good three-quarters of an hour walking backwards and forwards between 2 spots on the track before the bird finally showed. Our final full day was spent on a whistle-stop tour of open pastoral landscape to the north of Nova Friburgo with remnant fragments of forest. Our first stop gave us Blue-winged Macaw, Streamer-tailed Tyrant and the classic Guinness bird, the Toco Toucan. Another stop at an unpromising tiny roadside clump of trees produced the endemic Serra Antwren. The wonderfully named Firewood-gatherer, so named because of its huge stick nest was another bird that duly obliged. 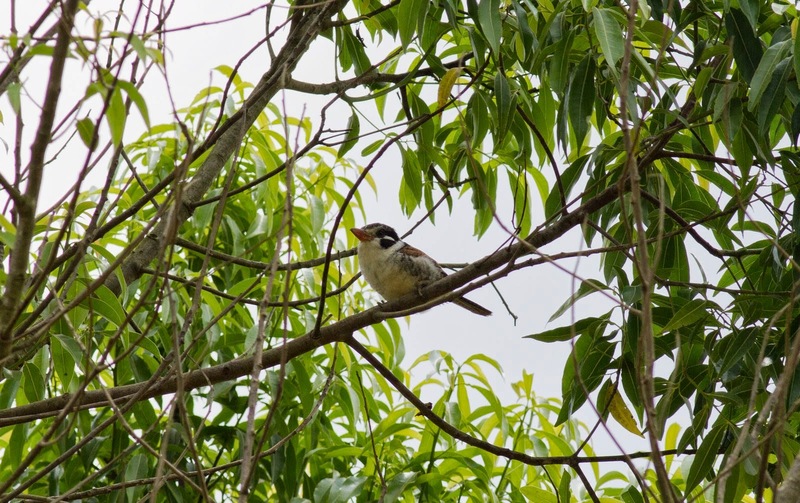 Pulling in next to a cattle yard, a quick play of the tape drew an instant response from a pair of White-cheeked Puffbirds. Our lunch stop was also the site for the slightly bizarre looking Curl-crested Jay but with the threat of impending rain we quickly moved on to our most important target bird of the day, the Three-toed Jacamar. This is a very rare and range-restricted species with probably only 1000 individuals left. We turned off the main road on to a dirt track and stopped almost immediately at the end of what seemed like someones drive with a few large trees on our left. It was a surprising site for such a rare bird but within minutes up popped not one but three birds which put on a great show for us, a fitting end to a fantastic trip. 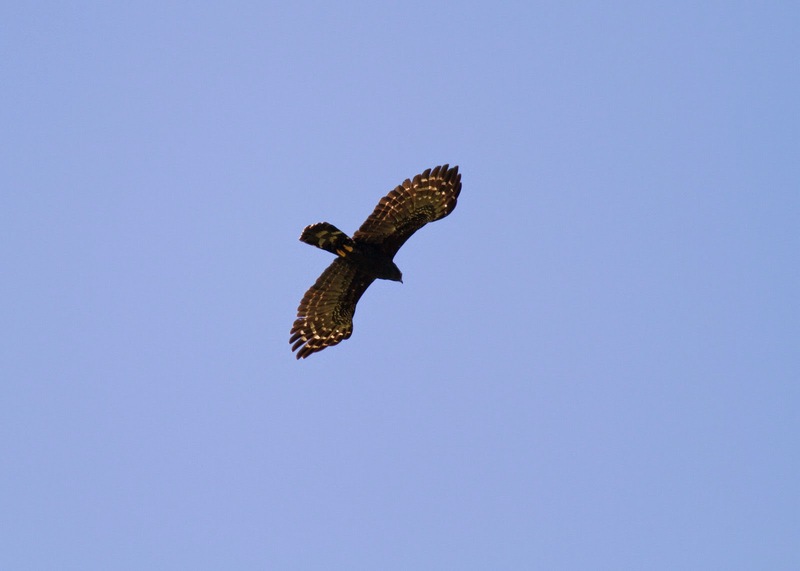 The drive back to the lodge added Burrowing Owl and Rufous-capped Antshrike to the list. We had a few hours to ourselves on our final morning before our scheduled departure at 11am. 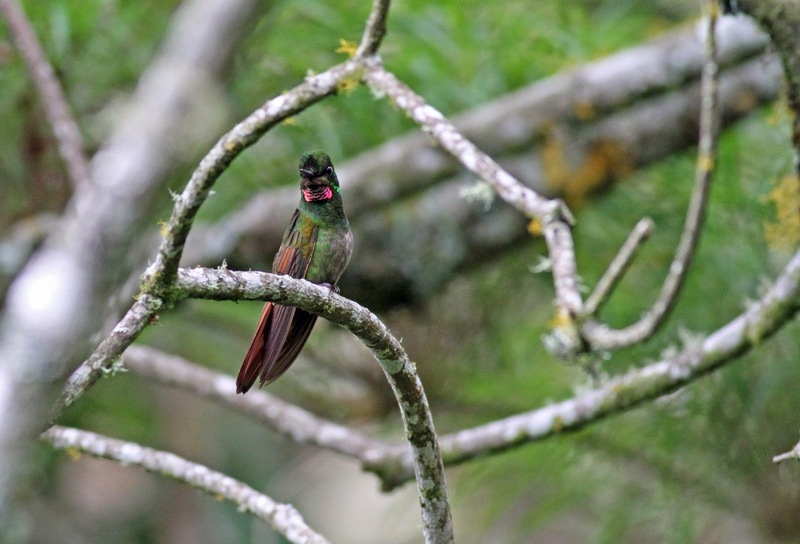 I headed up in to the trees around the garden and was delighted to find (and identify) by myself another regional endemic, the Black-capped Foliage-gleaner, but it was soon time to make our final drive in our trusty minibus and return to the UK. If you are interested in doing the same tour check out Serra dos Toucanos website here. 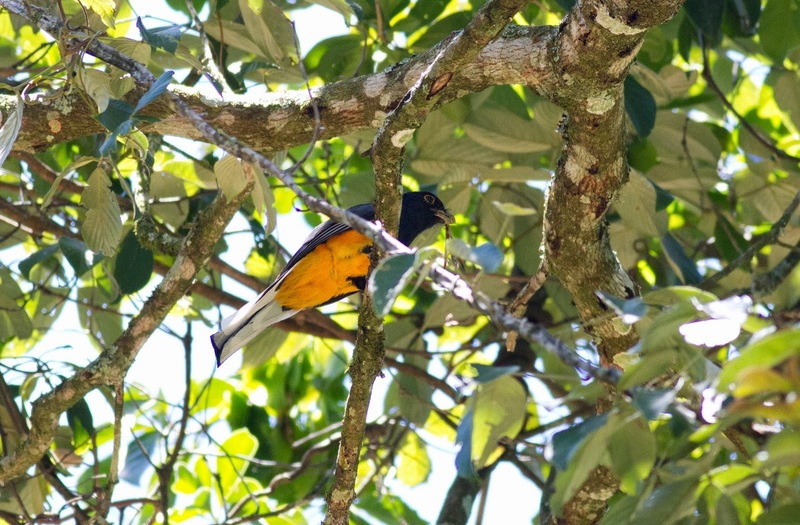 I travelled with Birdfinders (although other bird tour companies are available they use the same lodge and the same guide at sometimes a higher cost) and had a great time. It's been a while since I last posted; 2 reasons, first I went on a birding holiday to Brazil for 10 days; second, I arrived home and within three days was laid low with a horrible flu-like virus that knocked me out for nearly 2 weeks. So back to Brazil. 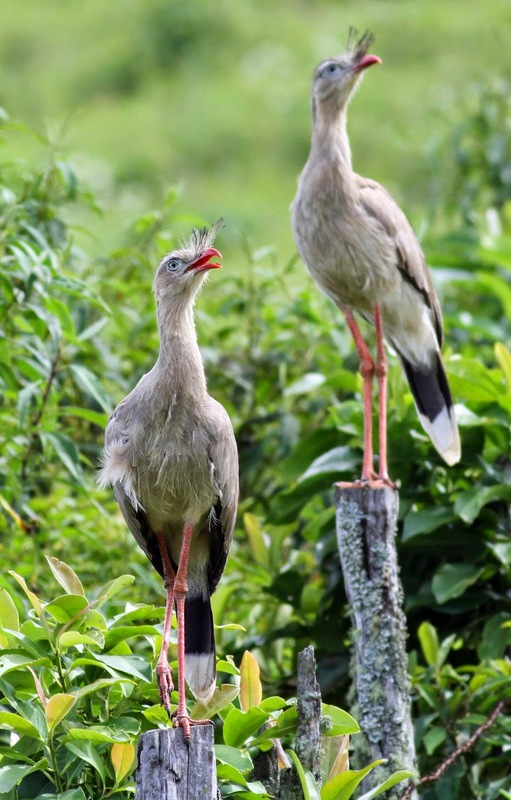 Brazil is a vast country and my tour visited just a tiny part of it near Rio de Janeiro concentraing on endemic and regional endemic birds of the Atlantic rain-forest, a much diminished and fragmented habitat. We were met at the airport in Rio by our guide, the excellent Andy Foster, incredibly patient, genial and a superb birder, and driven straight to Serra dos Toucanos lodge about 80 miles away. The highlight of the drive was the numerous Magnificent Frigatebirds cruising at eye-level along the massive bridge that crosses the bay around which Rio is built. 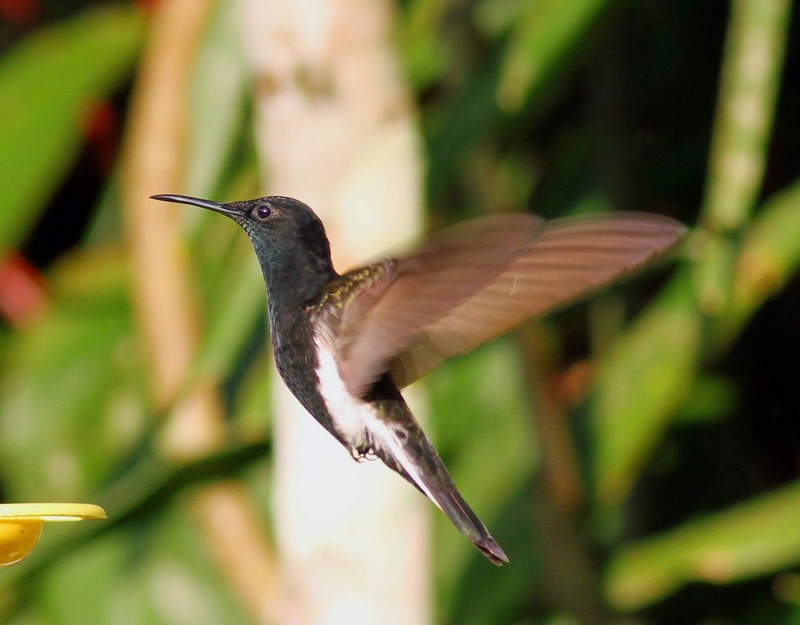 At the lodge we were immediately seeing our first endemics in the garden such as Brazilian and Green-headed Tanager, Sombre Hummingbird and Black Jacobin before being served a filling lunch. After lunch Andy led us on our first walk in to the surrounding forest, secondary growth that had reclaimed an abandoned banana plantation, but still rich with birds including the endemic Scaled Antbird. 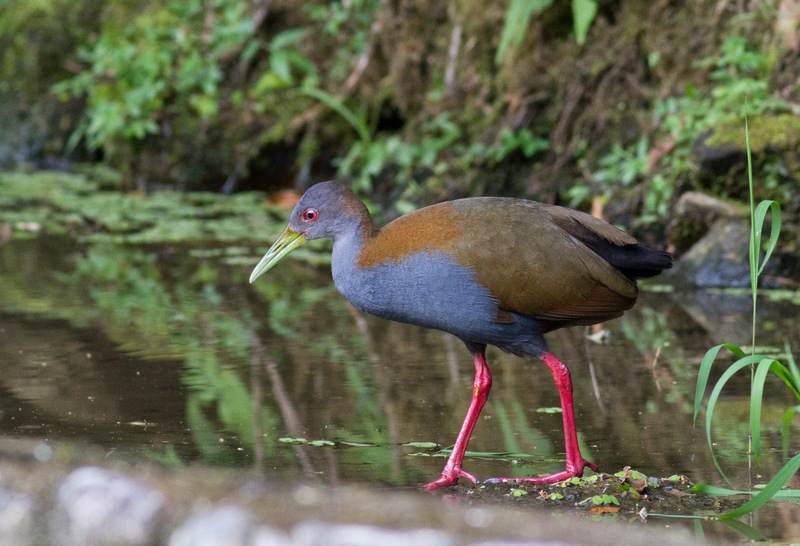 During evening drinks and the days bird list on the verandah, the lodges Slaty-breasted Wood-rails, another endemic, put on a good show emerging from the forest and stalking around the edge of the garden pond. 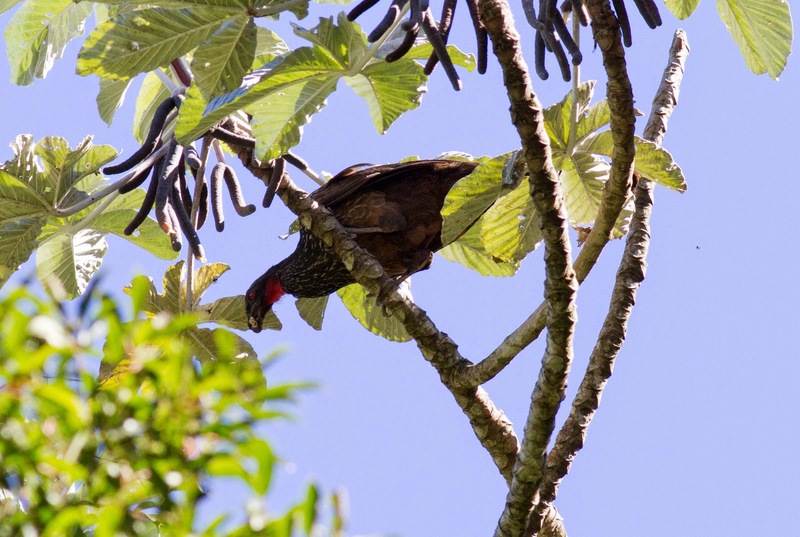 Day 2, our first full day, saw us heading upwards to Pico Caledonia, a mountain that reaches up to 2100m, in search of higher altitude birds and some particularly special endemics. We had barely left the minibus when the calls of the very localised Black-and-Gold Cotinga had us scurrying up the steep track to enjoy some excellent views of calling males. They were also joined briefly by a Swallow-tailed Cotinga. The even rarer Grey-winged Cotinga (a species only described in 1980 and only known from a handful of sites) was harder to find. A calling male tantalised us for some time before Andy spotted it perched on a distant tree, not exactly the best views in the world but a relief to catch up with it. Climbing beyond the trees to the scrubby low bushes at the top of the mountain our next target was the Itatiaia Thistletail, another very localised endemic. This too gave us an anxious wait before showing briefly, but eventually it decided to show a little better in the bushes below our viewpoint on the stairway that climbed the mountain to the communication aerials on the mountains summit. Other highlights were the creeping mouse-like Serra Do Mar Tapaculo (described only in 2006), Rufous-tailed Antbird and Brazilian Ruby. From our lofty position the views too were also tremendous but we also had an interesting encounter with a swarm of bees which appeared from nowhere. Andy ordered us to lie on the ground and keep still as the swarm passed over us as the bees could be potentially aggressive. After a successful trip up the mountain we moved to a lower, more open area and here a family of Red-legged Seriemas put on a terrific display. The following day, we went in the opposite dierction to the lowland forest area of REGUA, a wetland and forest reserve that has been reclaimed from old pastureland by the planting of thousands of trees. In the heat of Brazil, the trees grow rapidly and the areas we were birding in with large trees had only been planted within the last 10 years. The change in altitude and the wetland brought a new set of birds and two endemic antwrens, Unicoloured and Silvery-flanked, and the endemic Sooretama Antshrike. For variety, we also saw 2 Capybaras and a Broad-snouted Caiman. Returning to the lodge in the mid-afternoon there was time for a visit to a trail just up the road where we came across yet another endemic Antwren, Star-throated and also Spot-breasted Antvireo. Day 3 was spent fully at Serra dos Toucanos exploring the grounds more fully and also giving the photographers some free time to concentrate on taking photos. Highlights were Rufous-crowned Motmot, a superb but elusive bird, Black-throated Trogon, White-eyed Foliage-gleaner and stunning views of Rufous-capped Antthrush, walking along the forest floor with its cocked tail reminiscent of a tiny moorhen.